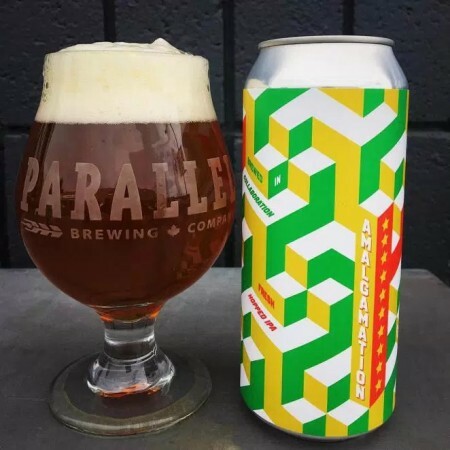 VANCOUVER, BC – Parallel 49 Brewing and brewing supply company Brew Culture have announced the release of a new beer brewed in collaboration with eight other local breweries. Amalgamation IPA is an 8% abv and 40 IBU fresh-hopped ale made using 300 pounds of Amarillo hops from Virgil Gamache Farms in Yakima, Washington. It was brewed at Parallel 49 with the participation of brewers from Bomber, Boombox, Dageraad, Doan’s, Four Winds, Hearthstone, Parkside, and Powell, and sponsored by beer delivery service Direct Tap. Amalgamation is available now on tap and in cans at Parallel 49, and will be on the shelves soon at select private liquor stores in British Columbia.